Guideline Publications "Combat Colours" series returns with No. 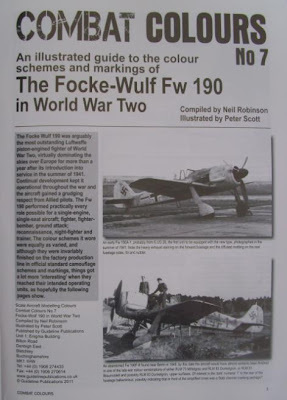 7, An illustrated guide to the colour schemes and markings of the Focke Wulf Fw190 in WWII, "compiled" by Neil Robinson and illustrated by Peter Scott. Based on articles that have appeared in 'Scale Aircraft Modelling' magazine - most notably my articles - ie the 'Aircraft in Detail' features devoted to the A-series fighter variants (Vol 24 no. 9 November 2002) and the Sturmgruppen (Vol 23 no. 1 March 2001) - Combat Colours no. 7 is a nice 82-page A-4 format softback of Fw 190 profile artwork. This title was planned about eight years ago but shelved back then - in fact looking through I recognise much of the text; entire paragraphs have been lifted from my articles. A credit would have been nice. Still Robinson has done some work on the captions it would appear and artist Scott has exploited the latest Luftwaffe colours/image research and photo discoveries. The work has around 25 pages of sub-type variant description and operational history and features an interesting if largely unexceptional selection of photos courtesy of Barry Ketley. 'Interesting' is the best comment I can come up with for the artwork to be honest. While of decent quality and generally 'accurate' in his interpretations ('Yellow 17' usually associated with Willi Unger of IV(Sturm)./JG 3 being a rather unfortunate exception) the profile artist favours a 'flat' style with no weathering, shadowing or highlighting that is a little too neutral for my tastes if truth be told. The images themselves are also a tad on the small size. Overall I guess around one hundred machines are illustrated, most A-variant types, although there are a few pages of F & G Jabo and Schlacht machines. No Doras though. If you have Scott's 'Battle of Britain Emils' title in the same series you will know exactly what to expect. Do modellers prefer this style or would they prefer to be inspired by Sundin's or Dekker's large scale 'life-like' images? I guess you get what you pay for - and that pretty much applies here. Slightly more expensive than an Osprey, artwork of similar quality to John Weal's, ie not up the standard of a Hector or Laurier, but, depending on your point of view, very good value for the amount of info presented. 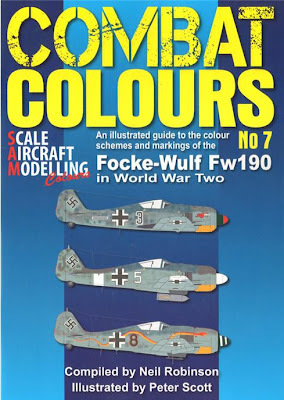 While similar in concept and execution to the 'Histoire and Collections' illustrated Fw 190 profile book, this new Guidelines title is far better than that absymal effort from the French publisher (distributed by Casemate). For a book of profile artwork, the aircraft has to look 'right' and that is certainly the case here. Like that H&C Fw 190 title this book features pages illustrating stencil placement but includes additionally a nice selection of good quality emblem illustrations and around ten machines have been selected for a four-view treatment. The 'meat' of this Guidelines title though is the detailed profile captions which must amount to many thousands of words. In fact it occurs to me that this book could usefully be read alongside Rodeike's 'Jagdflugzeug 190' bible if you have this German title and do not read German. Recommended with the odd reservation.
" ..I offer a few comments on this publication, a copy of which I received a few days ago. Neil has made a number of observations on it that I concur with and I will not repeat, though I will share a few thoughts. In my opinion, there are a few discrepancies and omissions of note. First, as a book that heavily emphasizes colours, there is no colour key to relate to all the colour profiles! Certainly this is needed as there are no colour call-outs adjacent to any of the profiles / plan views. For example, there is no observable difference between RLM 65 and RLM 76, yet both colours are discussed. Furthermore, the dark blue grey is presumably RLM 75, yet it is darker than RLM 74 which to the knowledgeable is the reverse. Other colours are given a similar treatment: RLM 02 appears as RLM 83, RLM 83 appears too light and looks more like RLM 82, etc. The RLM 24 blue looks violet in my copy of the book. Regardless of any limitations in offset printing, the colour key would facilitate the reader’s understanding and identification of the colours and convey the intent of the author. 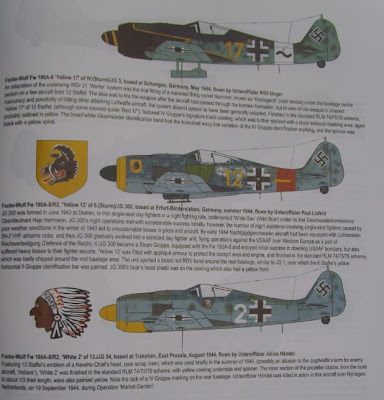 There is enough confusion with regards to identifying Luftwaffe colours, not to mention the repetition of ancient errors and misinterpretations. This publication does nothing to help the situation when it really could have been a positive contribution. Second, with regards to the colours on early A-1s and A-2s, the authors cannot seem to make up their minds on whether they were 02/71 or 74/75. The following might help. There is a fascinating example of a transition aircraft on page 4. This aircraft, Fw 190 A-2, “sw.8+-“ of 5./JG 2 was taken in the summer of 1942. A slightly better quality image of the bottom photo appears on page 116 of Smith and Creek’s latest book on the Fw 190 A (Classic, 2011), and this is the one I will refer to. My belief is that this aircraft was given the new colour at it operational base but left its original 71/02 uppersurface scheme that is visible in the Smith and Creek photograph. Indeed, A-2s were being manufactured between August 1941 and August 1942 and later concurrently with A-3s, so probably more than half of all A-2 have been in the original scheme with the remainder transitioning to the new grey colours RLM 74, 75 and 76 from March-April 1942. (Colours RLM 77, 78, 79 and 80 started to appear perhaps a month later.) The main take-away is that this aircraft might be a very important clue regarding the RLM’s L.Dv.521/1 instructions of November 1941 that have so far defied explanation about finishing fighter and Zerstörer aircraft in “Farbton 74, 75, 76, 65” that Ken Merrick and others have puzzled over for years. I’ll have more to say about that in another discussion. Thirdly, it is certain that the late A-2s and A-3s were finished with the new grey scheme of 74/75/76, but even here there were variations. An interesting example appears on page 8 (bottom) of the book. This is an outstanding overhead view of Fw 190 A-4 “sw.12+I” of 8./JG 2. Certainly the wing scheme cannot be 74/75. 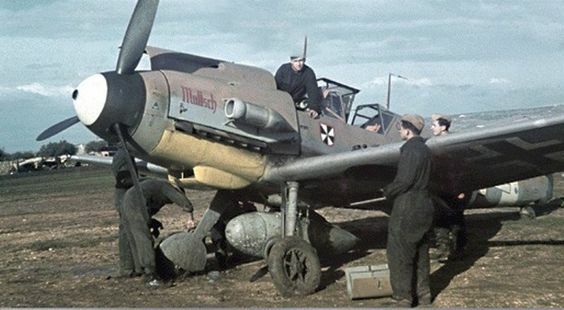 Here is another example of the use of RLM 77 Hellgrau that when one looks closely is seen to appear on an increasing number of Bf 109s and Fw 109s. The grey tone of the lighter and darker colours is far too light to have been 74/75, though in this case was 77/75. Finally, the photographs in the book lack any indication as to their source / attribution, and, there is no list of references. In many of the captions there are suggestions that the authors consulted some books but the reader is left to wonder which ones. This information could have been conveyed in the captions to allow the reader to consult the available references to study the photographs themselves and compare with / validate the authors’ interpretations..
despite these lapses, the amount of information presented in this package makes it a bargain given the purchase price ..."